It’s fair to say that the iPad mini has made a pretty good impression since the Wi-Fi model released on November 2 and it has already sold in huge numbers. However as it’s a great gift for the holiday season those sales figures are set to rise by even more, especially as the iPad mini Wi-Fi plus LTE model also goes on sale in US stores today. Customers can also order from Apple online with a two-week shipping wait. The iPad mini was a long time in the making as we first heard rumors of a smaller iPad a year or so ago. Apple had a lot to live up to after some decent Android competition, especially with the Google Nexus 7 back in the summer and the iPad mini will undoubtedly be on plenty of Christmas wish lists. Many potential customers will be pleased to hear then that following the earlier iPad mini Wi-Fi model the Wi-Fi + Cellular is hitting stores today. According to BGR some people who pre-ordered the LTE-enabled iPad mini received it yesterday and Sprint also announced in the early hours of this morning that the Wi-Fi plus LTE model is now on sale in select stores nationwide. It also looks likely that the tablet will also arrive in Apple stores from today as well as other carrier stores and it should also be on sale at Best Buy. How well stocked the stores will be is unknown so if you want the iPad mini Wi-Fi + Cellular it’s probably best to check your local store for stock as soon as you can. The iPad mini Wi-Fi + Cellular can also be ordered through the online Apple Store here on carriers Verizon, AT&T or Sprint, with shipping due in two weeks. The prices are $459 for the 16GB version, $559 for the 32GB version or $659 for 64GB’s. The Wi-Fi version by comparison is $329, $429 or $529 respectively. As a brief reminder the iPad mini Wi-Fi + Cellular has a 1GHz A5 dual-core processor, runs on iOS 6, has a 7.9-inch IPS display with resolution of 1024 x 768, 512MB of RAM and 16, 32 or 64GB internal storage options. It also has a 5-megapixel rear camera with 1080p video capture and a 1.2-megapixel front-facing camera. 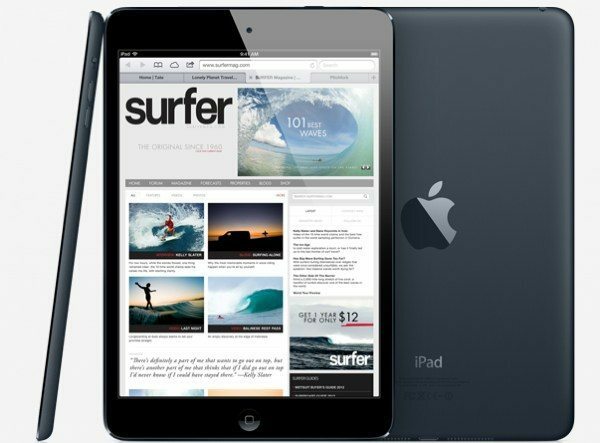 Are you one of the people who have been eagerly waiting for the LTE-enabled iPad mini to release? Will you be checking with your nearest store or ordering online and also we’d be interested to hear if you find it easy enough to get your hands on one or if they sell out quickly? Let us know with your comments.